What if. . . Your internal dialogue sounded something like this? This Free Live Introduction Webinar Wednesday May 21rst at 7pm (PST) will help you understand how Women-N-Spirit helps transform your life. Come join us at our upcoming free video introduction online this Wednesday and find out why a Women-N-Spirit Retreat in Seattle would help create success so you can achieve anything! 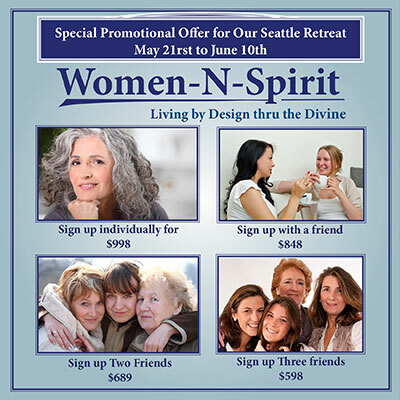 This webinar will prepare you for our Women-N-Spirit Retreat in Seattle, together we will break through the barriers of limiting patterns of beliefs, thoughts, feelings and behaviors that have kept you from being all that you were created to be. Come learn how your going to create your patterns of success so you can achieve anything! [color-box color=”gray”]I feel so blessed that I was created absolutely perfectly. My uniqueness offers me opportunities to share very specific gifts with the world, and when I embrace and honor these gifts, I live in the flow. When I see the need for change in the world, I begin making changes within myself, because I know that my external world is a reflection of my internal world. I take incredible care of myself by offering love, compassion, forgiveness, and other positive emotions to myself first. I realize that I am able to give to others at the capacity that I give to myself. I feel beautiful and radiant from the inside out, and people often make comments to me like, “ you seem so happy and content!” I truly feel that the universe offers me lessons in life, and when I choose to learn them in an effortless way, I see no mistakes. There is truly not another individual in the world like me, and I feel blessed. Come join us at an upcoming Women-N-Spirit Retreat and transform your internal dialogue to one that serves you and your uniqueness!